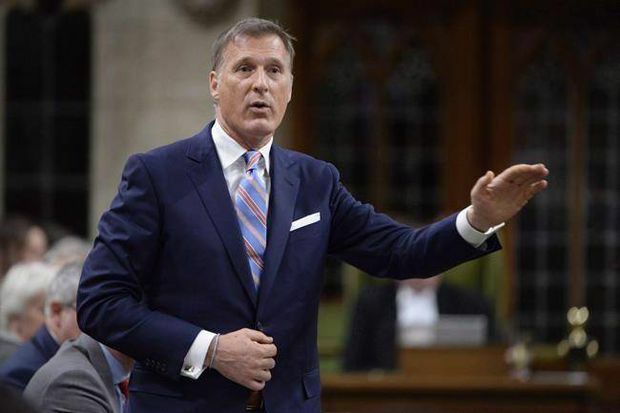 Conservative MP Maxime Bernier has renewed his call to end Canada’s supply-management system amid a heated trade dispute between the Trudeau government and U.S. President Donald Trump. Mr. Bernier, a former Conservative leadership contender, uploaded to his personal website last week his book chapter criticizing supply management, which Mr. Trump has demanded be dismantled in trade talks. It is the same chapter that led Mr. Bernier to postpone his book indefinitely in April after he suggested Conservative Leader Andrew Scheer won the party leadership with the help of “fake Conservatives” from the Quebec dairy lobby. The move comes as the House of Commons unanimously agreed to an NDP motion on Monday to condemn the U.S. administration’s “illegitimate” import duties on steel and aluminum and pledging support for supply management, the system that regulates prices and production on dairy, eggs and poultry in Canada. Maxime Bernier in the Commons last year. Mr. Bernier’s chapter was posted online just days before the Group of seven summit in Quebec, after which Mr. Trump blasted Prime Minister Justin Trudeau as “very dishonest and weak” and took aim at Canada’s dairy industry. “Our Tariffs are in response to his of 270% on dairy!” Mr. Trump tweeted on Saturday. The chapter was posted for download on MaximeBernier.com on June 5, after the United States imposed punishing tariffs on Canada’s steel and aluminum industries and the day after Mr. Trump accused Mexico, Canada and China of treating American farmers unfairly. “Canada has all sorts of trade barriers on our Agricultural products. Not acceptable!” Mr. Trump wrote on Twitter on June 4. Mr. Scheer’s spokesman Jake Enwright wouldn’t comment on Mr. Bernier’s chapter. “I’m going to continue to decline comment on this particular issue,” he said. The Prime Minister’s Office also had no comment. A spokesman pointed to previous statements saying the Trudeau government is strongly committed to supply management, although the Prime Minister’s recent comments in U.S. media that Canada was moving toward “flexibility” on U.S. access to certain agricultural products in Canada, including dairy, rattled the industry. As a show of support, Mr. Trudeau is set to meet with the Dairy Farmers of Canada on Tuesday. MPs from all sides said Mr. Bernier’s decision to repost the chapter is not helpful during the Canada-U.S. trade spat. “We need to all come together with a consistent message and have a little sanity in the midst of the turbulent negotiations,” Conservative MP Marilyn Gladu said. NDP MP Charlie Angus said it is not the time for Canada to give into threats from the U.S. administration on supply management. “I would say to Maxime, just put a lid on it while we deal with this unprecedented attack from Donald Trump,” Mr. Angus said.